Make your space look fresh and feel natural in Wilton Manors with Concrete Vent Blocks from the esteemed professionals at Atlantic Coast Precast. Concrete vent blocks, also called breeze-blocks or pattern blocks are often used to add a bold visual effect or character to a building while adding functionality and privacy. We can cast personalized precast products from your samples, sketches, and specifications through our flexible manufacturing process at cost-effective rates. Precast concrete is reliable for many applications and will resist creep and shrinkage, too. As a sustainable material in Wilton Manors, concrete vent blocks from Atlantic Coast precast will be eco-friendly and easy to maintain, strengthening over time for maximum durability. 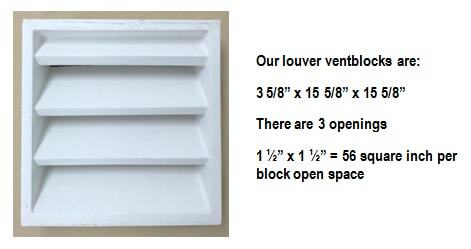 We can help you choose between a range of styles, shapes, sizes, and colors when it comes to personalizing your vent blocks. Since 1965, we have been proud to deliver a high standard of service and quality products. For beauty enhancement, our decorative louvers are one-piece and can add a dramatic flair and bold visual effect to any commercial or residential space. Our two-piece Wilton Manors concrete vent blocks, on the other hand, are functional and serve a practical purpose. They cut heavy winds and block debris from entering without hindering the passage of fresh air and natural light. While shading your space from direct sun rays, they can also allow trapped moisture to escape. 4 "X 8" X 16"
4" x 12" x 12"
4" X 16" X 16"
We offer STACKABLE VENT BLOCKS that are ideal for ventilation of warehouses and public areas such as restrooms.